A picture claimed to show the alleged seventh-generation iPod nano appeared on Monday on the website tw.apple.pro (via Google Translate). The report claims that the camera is a low-resolution 1.3 megapixel lens. Crediting a source named "Ray" from California, the site suggests that the next iPod nano will not include a clip as the current model does. Placing a clip on the back of the device would cover the camera lens on the supposed device. Tuesday's picture is not the first report to suggest that Apple could add a camera to its multi-touch iPod nano. In early April, an unverified photo showed an alleged seventh-generation iPod nano frame with space in the back for a rear-facing camera. 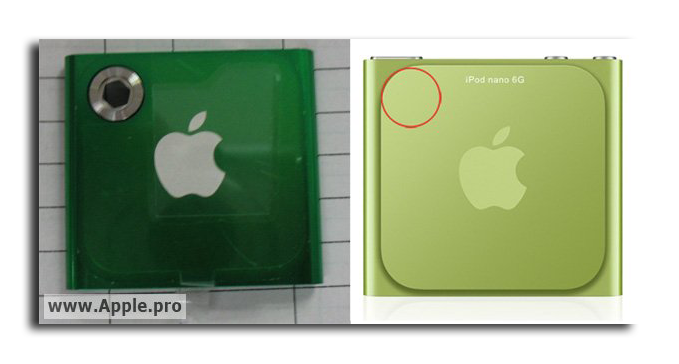 The Taiwanese Apple blog has correctly leaked each of the previous six generations of the iPod nano. Last year, they leaked photos of a tiny touchscreen that went on to become the multi-touch display for the sixth-generation iPod nano, released in 2010. The larger fifth-generation iPod nano, released in 2009, did have a camera, along with the classic-style iPod click wheel. But the camera was ditched in the 2010 model, allowing Apple to create an even smaller device driven by a multi-touch display. Adding a camera to the iPod nano once again could appease some critics who were disappointed that the feature was removed last year. But removing a clip from the rear of the device would also be a detriment, as the small size and inclusion of an integrated Nike+ pedometer has made the sixth-generation iPod nano a strong choice for use at the gym. Google launches cloud music, previews next Android, promises OS updates for 18 mos.